After a horrendous Friday in which Brisbane received an unprecedented amount of rain in less than 24 hours, the sun came out for the Ladies Day clash between the Mayne Tigers and the Moreton Bay Lions at Mott Street yesterday. Any concern that the ground would not be ready for the day were allayed when dawn broke. The ground at Mott Street drains very well and by the time the first game needed to be played the oval was in a safe condition for footy to get underway. The ground staff at Tigerland are to be commended as the ground came up beautifully and it was essentially dry weather footy albeit a little heavy. Whilst the Tigers really had the measure of the Lions in 2014, a new name and a new coaching group led by former Tiger Rob Dickfos has made a big difference and it is clear that they have come ahead in strides over the summer. The Lions have recruited well and will continue to improve as the season progresses. A few late changes had to be made for the Tigers with Sam Paterson and Benn McElligott unavailable due to the weather and matters to attend to at home so preparation was disrupted. Gabe Dillon was called into the team but sustained a game ending injury in the first few minutes before he could make an impact on the game. The Tigers started well with Luke Faulkner kicking five goals early but left the ground before the main break and didn’t take any further part in the game. 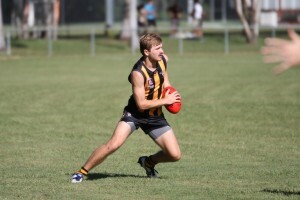 The Tigers were forced to reshuffle the team with swingman Corey Massingham going forward to reward himself and the team with four goals in a very handy effort. 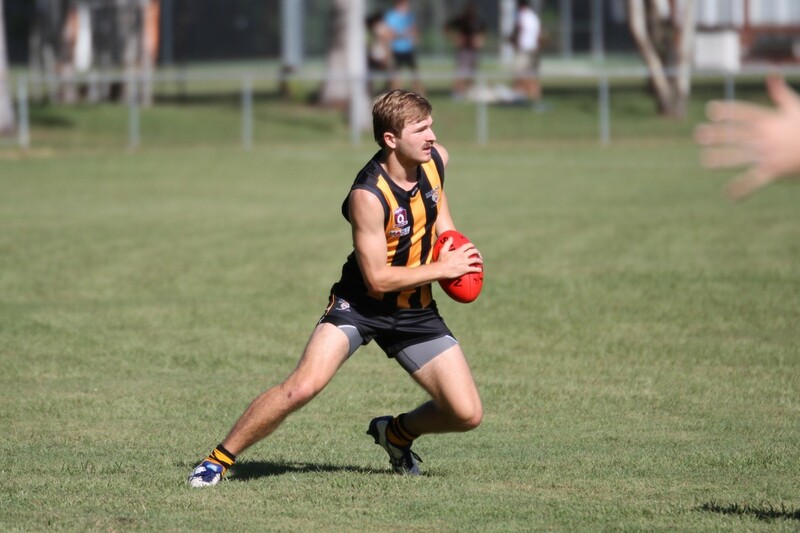 Fraser Thompson and Taylor Murtha also stepped into bigger duties in the reconfigured forward line to play integral roles to record four and three goals respectively and keep the Tiger effort on track. The back line continues to be integral to the success of the team and new Tiger Dane Lucas was tremendous at centre half back while Dean Hartley was ever reliable. The forward line was once again the beneficiary of Spencer Greville’s rebound work and penetration off the half back line in a best on ground effort. In the midfield, the old firm of Brown and Daly put their experience to good work. Ben Heffernan Roper was another standout as he continues on his journey to full match fitness after a season away from footy. Young ruckman Luke Radonich rucked all day once again to give the Tiger’s first use of the footy in a great effort of endurance as well as skill. A scare went through the Tiger camp late in the day as it looked like he would also succumb to injury but he quickly regained his composure and completed his day’s work in a strong message to the team. The loss of players before the game and before the main break stretched the rotations and meant the team was quite fatigued by the end of the match. However, even though it was a difficult day for the Tigers, gaps and changes were filled efficiently and the team finished with a comfortable win. 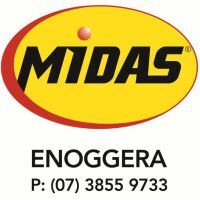 The Tigers will enjoy a weekend off and come back energised for the away clash with the Caloundra Panthers in two weeks time. A few niggles will also benefit from the break to give the Tigers a chance to come back eager to hold their spot in the top four. Best: S Greville, C Brown, D Lucas, D Hartley, F Thompson, B Heffernan Roper.